Last night I had dinner with about a dozen graduate students who are all members of the Women in Leadership Association at the Drucker School of Management at Claremont Graduate University. The women—and one very brave man—are all contemplating careers in the nonprofit sector, and I have to say, it really gave me hope. It wasn’t so much that they were—to a person—bright, passionate, articulate. Many in the nonprofit sector have those qualities. But with all our bad press, generally lower salaries, organizations with fewer resources, they were choosing this field, and preparing themselves to bring a level of professionalism too much of our sector lacks. Then, just as I was feeling good, the Chronicle of Philanthropy reported that female nonprofit executives continue to make less money than their male counterparts (http://philanthropy.com/article/Gender-Gap-Persists-in-CEO-Pay/128940/?sid=pt&utm_source=pt&utm_medium=en). Not, mind you, that this particularly surprised me. Indeed, during our wide-ranging conversation last night was one about the lack of women CEOs in the larger nonprofits. A number of the women are in CGU’s Arts Management Program—and we tried (in vain) to think of a woman CEO of a large Los Angeles art museum. Yet, women make up the vast majority of the Arts Management Program and are overrepresented as leaders in smaller arts organizations. Sigh. Things move slowly. Perhaps not so slowly for women as for men of color. The lone man in our group last night was African-American. Statistically, he’ll do even worse. And while that bothers me in all areas, in our sector it really, truly makes me angry. If we, the so-called do-gooders, can’t figure out how to really level the playing field, what are the odds the for-profit sector will do it? Pay them for the job they are going to do—and may that pay fair and equal. Provide opportunities and look for ways to teach new skills (and maybe learn some yourself). Get out of your comfort zone. Interact with those who will question you, who may have a different reality or way of looking at things. And if you are not (yet!) the person who does the hiring, be the very best hiree you can. That means pushing out the boundaries, doing not just what you are supposed to but going that extra step beyond. Don’t accept discrimination of any sort—but also don’t call honest criticism or someone else’s good fortune something it most likely is not. Above all, make sure that when you are in a place where opportunity is truly equal, you are equal to the offered opportunity. I know that my dinner partners last night will not just be successful, they will make sure that they continue to pave the way for those who follow them. And I hope that in the next time the Chronicle publishes an article about salaries in the nonprofit sector, they go against what has become the grain and announce that the salary gap has been closed; nonprofits have made the leap to pay for performance and not for physical characteristics. 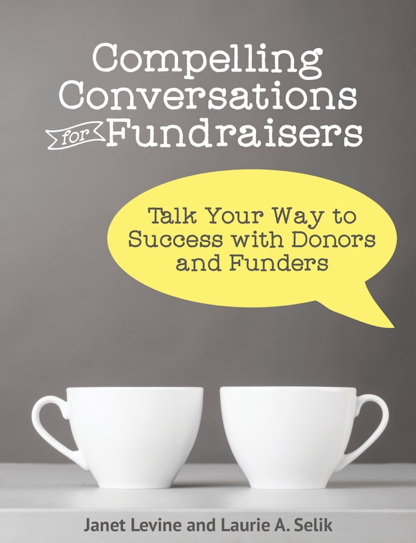 Janet Levine works with nonprofits and educational organizations helping to build fundraising capacity. Learn more at http://janetlevineconsulting.com. This entry was posted in business practices, change, hiring, organizational culture, professionalism and tagged business practices, change. Bookmark the permalink.